Although I’ve canned and created many things in the kitchen, I’ve never made my own ketchup. I ran across this recipe at mommypotamus.com. I think I’ll try it. Let me know what you think if you try this stuff. 1. Place all ingredients in a small pot/pan and whisk together. 2. Place on the stove and bring to a boil, then reduce heat and simmer until reduced to the consistency you prefer. Store in the fridge. 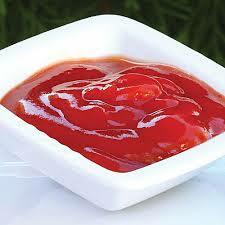 Shelf life: Many online recipes for homemade ketchup say they last in the fridge for 1-2 weeks. I’ve never made my own ketchup, but I’ve made my own sauces before and I’ve LOVED them! Sound like you’re a good candidate to make your own ketchup! Let me know if you try it.